The Countertop Model, Double Pocket Tri-fold Brochure Holder creates a two pocket counter model tri-fold brochure holder. 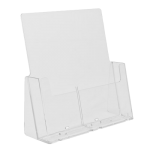 This model is ideal for displaying two different brochures, each up to 4 3/8” wide. The pocket divider creates a perfect side by side counter display. 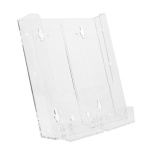 The pocket divider locks easily into place and remains perfectly straight when inserted into the pre moulded channel. With this product, you can double your exposure while using minimal counter space. Ideal for literature up to 4 1/2'' wide (tri-fold brochures). Display two brochures side by side. 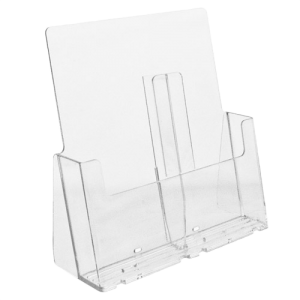 Use this brochure holder wherever you need to display two brochures in one location; real estate, open houses, lobbies and tourist bureaus.